I couldn't have predicted so many jewelry posts. What can I say? I get on kicks. I saw a necklace like this in a store but it was shorter and the braid contained different kinds of beads. I wanted it longer with one type of bead. Tada, the braided bead necklace. An amount of beads, it's hard to say how many, I used about 4 more beads than this jar holds. Just get more than you'll think you need, this is the best I can tell you. Chain, about 20"-22" depending on the length you want. Cut 6 pieces of thread at about 10" or so in length (much longer than you'll need, but this makes it safer - and safety first) and thread onto each string 5.5" of beads. Here's what beads on a string looks like. Next, take two strands of beads and thread the two threads through one bead tip. Tie a double (or triple, why knot?!) knot in the two strings and trim the tail. Slide the bead tip up to the knot and use pliers to clamp the little clam shells over the knot. Repeat for each pair and then repeat on the opposite end, making sure to get the knot as close to the bead tip as possible. Clamp three of the ends to one large jump ring. Connect that jump ring to you chain, a piece about 10" long, and then connect the remaining end of the chain to your clasp (see note at bottom). Prepare the other half of your chain by connecting one end to the other end of the clasp and the other to another large jump ring. The braiding part is a little tricky if you don't secure your beads strands to something. You may want to tape them down to the edge of a table or pin the to a pin cushion that won't move (or if you want it to take longer, a pin cushion that does move, like I did). Once it's secure, braid your three pairs. When you get to the end, be sure to secure the clamps on the jump ring in an order so that i doesn't unravel the last braid. Then you're done! And you're fabulous! *Finally, the note about the clasp. As shown in these photos, I originally used a screw clasp. But being the fickle lady I am, I often need to create an adaptable piece to suit this trait (see posts of jewelry switch outs here). I split my second chain into two and rejoined them with another large jump ring. I then switched the screw clasp for a standard round-open clasp so that should I change my mind about what length I want this necklace, I am free to do so. Whew! This is a great tutorial! I've been inspired to take up beading. This is on top of my summer to-do list. Thanks, Abigail! It's totally worth taking up because it gives a much more immediate gratification than say sewing, baking, upholstery - and sometimes you just want to have something done and not have to a bit 'to do' to get your end result! Hi, i have only recently taken up beading, needless to say this is one of my favourite, just one question, i am using tiger tail .45mm i cant seem to braid them as it pulls stiff, what should i be using and or what am i doing wrong? Don't use Tiger Tail. It is a beading WIRE so it will be very stiff. Tiger Tail is used for more rigid projects, not for projects with drape or bending around, such as this one. I suggest you use fishing line or beading thread, such as Nymo or Toho. Both of them cost about 2 to 3 dollars or cheaper. Great tutorial - easy to follow, beautiful idea. This is amazing! I saw it on another site, and took me forever to realize it had a tutuorial. I'm over the moon!!! Can't wait to make mine. THANK YOU! I adore this necklace! What kind of beads are used (e.g. plastic/glass)? This is fantastic. A gorgeous necklace with easy to follow instructions? Definitely going to try making one of these! this is beautiful! i love the beads you chose! Hola, Gracias por este collar hermoso y fácil, lo voy hacer para mi, me gusto mucho, muchas gracias. Love this! Going to try it this weekend for sure! This necklace is so attractive! I love the simplicity and beauty of it! I tried it...with less beautiful results than yours!!! I have linked your post in my blog...hope you like it! Love the necklace. I'm going to make them for my bridesmaids. What size bead did you use? So! I actually went back to the bead shop the other weekend to get some more beads and check to see what the size was - and now I've forgotten! They are called Seed beads and the number 8 sticks out to me, it's also written on the bottom of the jar, "8R-E-705." I will make sure to check again when I'm back at the shop! They are larger than what I consider to be the most common little beads, but they're not terribly big - but I'm sure that's not helpful! But hopefully size 8 Seed Bead is! Thanks for the info. I used size 6/0. I made my necklaces and they look awesome. I found that twisting the paired strands and then braiding worked pretty well. I've also added a little extras to one side such as a leaf charm and fabric flower. I hope my ladies love them as much as I do. Wow, that's nice. Thanks for a great tutorial! It's a very pretty and elegant necklace, and I love the colour beads you have chosen. such a great tutorial, thanks!!! Thank YOU so much, ladies! I'm so glad you like it and that the tutorial was clear! I'm never sure if explaining things in the best way! I had a hank of inexpensive seed beads that were irregular in size so I made this as a bracelet. It was great because braiding does not require uniformity. I attached a jumpring to the ends and a toggle. The color possibilities are endless. Thank you for sharing this project. The top is gorgeous, where did you get it? The necklace and top are perfect with each other. Thanks! The top is actually a dress from H&M a while back. But they actually now have a top that has the same top as the dress - and I just bought it a few days ago! Merci beaucoup!!!! c'est très très joli!!! made this last weekend and thought it turned out way cute. thanks for the tutorial! I lost my inspiration,this tutorial it's a good one,thanks for it. 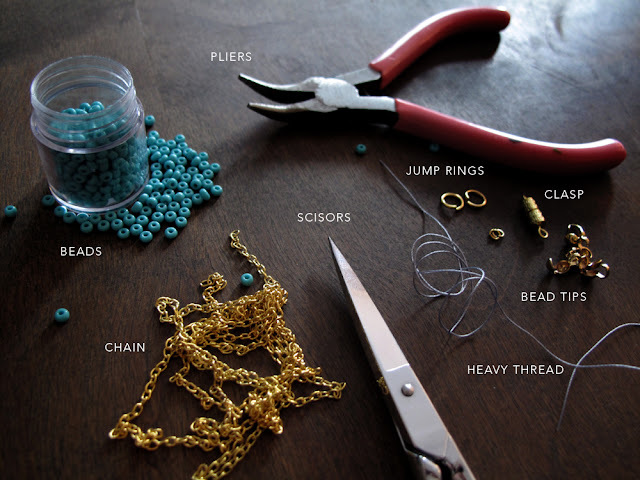 Where do the two small jump rings fit into this tutorial? I can't wait to make these as x-mas presents! So excited! At each end of the braid the three hooks come together on a jump ring. You can see them in the photograph, second from the bottom. @Maddy W.: I just made my first necklace as well. It will be a christmas present. As a tip I would advise you to keep the knot very big while still pushing it close to the beads and then holding on to it with one or if you have even two pairs of pliers. Don`t be scared, the thread can be pulled quite strongly. Thank you very much for the wonderful tutorial! It was fun (except for my manicure :P ) and looks so, so, so pretty! this is an amazing hand-made gift idea! my mom actually has super sensitive skin *allergic to things like nickel* do you think this gift would work for her? I imagine as long as you used nickel-free metal pieces the necklace would work great for your Mom. Maddy, I try and use my fingernails to keep the knot close to the bead while pulling it tight. Just wanted to let you know that I featured your cute necklace on my blog! In response to Bianca--I have to use nickel-free findings and www.consumercrafts.com is an excellent source for them. They even have boxes with an assortment of findins in silver and goldtone. Also Antique silver and copper findings. And very reasonable prices. Great people to deal with. Hope this helps. Can't wait to make the necklace. Silly me bought some of the wrong things, but I managed to make it work and now I have a very pretty necklace! great tutorial ! thank you ! Love the necklace. Can't wait to make one. I'm thinking about not using the chain (make it all beads). Can you tell me how long the string of beads were before and after braiding? Thank you. I love this necklace!!!! Thanks for the tutorial, can't wait to try it! I love this! Attempting to make as we speak... But 5.5" seems so short! I saved this tutorial in my bookmarks forever ago! I finally had some time to create this necklace for myself. Thanks so much for sharing it! Mine turned out great! I shortened the chain to 8" but other than that the dimensions were good. I found that JoAnn Fabrics had the widest selection of this kind of beads if folks are having trouble finding the right ones. I have to try this! Thanks! I can't wait to make this necklace! I have a ton of seed beads I've been trying to find a use for. I think I will attach the braid to the chain with a decorative clasp so I can wear it as a bracelet too. Sooo lovely! I'll share this on my blog! LOVE IT! Just curious about how much it cost you to make it. Hi, LJE! I don't quite remember, it was about 2 years ago, but maybe around $10? A big factor would be the quality of chain you buy, I think the beads were around $6-7. Thank you so much for this wonderful tutorial! I started this necklace yesterday afternoon. After staying up until 3am and working on it a little today, I was so happy to be able to wear it out tonight! Thanks again! Made this last night in just an hour or two (a little longer because I dropped a strand on the floor and had to find the million beads that went with it :), and LOVE it! I want to make more in a rainbow of colors! So pretty! Thanks! WOW! this is a super fabulous DIY! love your blog, you have a new fan!!!! Just made this last night. Amazing necklace, just hope my knots don't slip through the bead tips! Your tutorial is fantastic. I’m writing from bulbinblue.com, an up-and coming, dynamic, non-profit website for creative ideas and crafts. We’d love to feature your tutorial (text and pictures too). We are very keen to set up new partnerships with experienced and creative bloggers; we will make sure it's an easy process and provide your blog with lots of new followers. We would like also to translate the tutorial into French and German for our mother and sister sites, and link the tutorial to your blog. Our mother site bluemarguerite.com welcomes more than 200,000 visitors a month. Would you be interested? Please reply to us at blueteam@bulbinblue.com! Love this!!! Thanks for the inspiration! We feature DIY projects on our blog every Monday and we are featuring you tomorrow! If you would like to check out your feature our website is www.nevernola.com- Thanks again! If you accept, your article and your photos will be integrated(joined) on the site of marie claire idées and we shall put a link towards your blog. Thanks for this great idea! 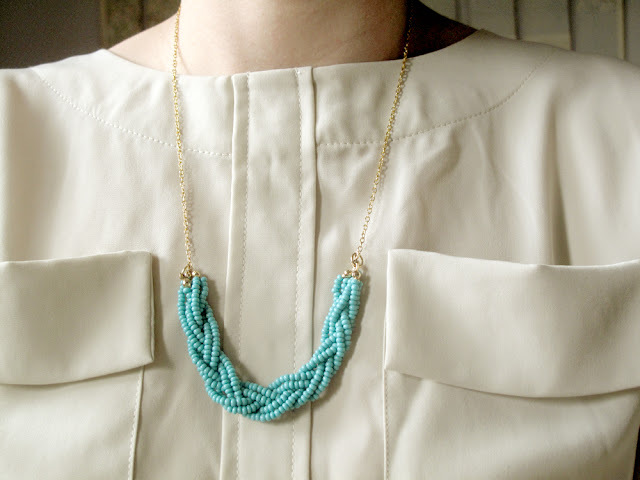 I mentioned your post on my blog (http://www.pearlsinacup.be/braided-bead-necklace/). You can see there my versions! I love that goldenrod color! just made this! i did used a thin wire instead of upholstry thread, but i wish i had just used the thread. i also use 3 different beads. i'm pretty happy with how it came out. considering how professional it looks, it was pretty simple to make! This is beautiful! As a semi-experienced beadweaver, I suggest you add a dab of jewelery glue (like E6000) in the step where you add the knotted strands of thread into the clamshell bead tip -- just for some extra security. It's so strong you only need a teensy tiny amount, a toothpick works great for application directly onto the knots before closing the clamshell beadtips tight - just don't get it on your skin or your tools! You can find it at places like ac moore or wherever you buy your beads. What a great idea to braid the beads! I actually made a couple for gifts this Christmas, and my sisters-in-law loved them! I featured it on my blog, http://www.mommasbestshot.blogspot.com/2012/12/at-jewelry-making.html I also made myself a 5 strand braided bracelet on stretchy cord inspired by your necklace. I love it! My 3 year old helped me by holding the end tight for me :) Thanks again! What a lovely idea. It has given me several more ideas for new jewelry pieces. Thank you! Love this necklace and will try it also. I think this would look good in black and white or red, white & blue! This is just like the necklace I made with my mother back in 1969. We made it in red, white & blue for the 4th of July. Thank you for the good memories you brought back. p-and-p-style.blogspot.com - Check this DIY-Fashion blog out! Beautiful! And such a great tutorial, Thanks for sharing! Love it! Keep up the good work. Your stuff is great. PS I love the name of your blog! Thanks for sharing your tutorial explains it well. I wonder if hanks of seed beeds might work also but they are usually on VERY cord/thread. Maybe after the first of the year I will try some I have. Too busy with the season for now. The best to you and thanks for sharing. love the necklace but don't use fishing line-it rots and breaks easily after time and beads everywhere. lots of inexpensive threads around. I prefer Wildfire because it is coated and doesn't need thread heaven or other conditioner. Too much work to use wrong thread. Hi, where can I get materials to make a necklace like this?? thanks! Thanks for sharing with us. Super cool! I actually have something slightly similar to this, but nowhere near as pretty. This is gorgeous. And with this style and that color, it's such a perfect necklace for so many outfits. Well done. I really like this. Thank you. I'm planning to make this as a gift to myself to myself and to my Aunts. Yes, they will be thrilled, as me!!! id so love to do this......unfortunately it is difficult to get supplies in Ghana. Thank You! Just stunning and great texture. Am thinking of using 3 different but similarly colored beads. Slide the bead tip up to the knot and use pliers to clamp the little clam shells over the knot. Hello, I know this was posted a long time ago but I was wondering what size bead tips did you use? If you get the type as shown in the pics, they seem to be available in one standard size in five different metal colors.